What Are the Silver Maple Tree Diseases With Black Spots? 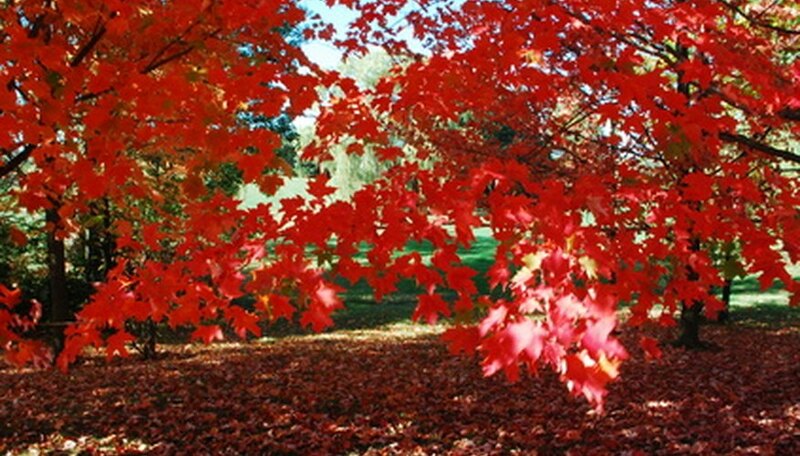 Silver maple trees are among the most common maples in the United States. They are fast-growing, thrive in poor soil and can be transplanted easily. As a result, they are among the most common landscaping trees around. Silver maples get their name from their leaves, which are silver on the underside. This silvery hue makes a perfect background to enable you to spot a number of silver maple tree diseases with black spots that can target your trees and bring them down long before the end of their predicted lifespan. Tar spots afflict silver maples usually in mid-June. They start out as tiny, pale yellow spots but soon grow and metamorphose into black globs that cause the leaves to appear as if they have been splattered by tar. When the leaves fall to the ground, the fungal infection that causes the spots overwinters where they fall, then splashes back up on the maple tree in the spring to start the cycle over again. While tar spots usually will not kill your tree, they are a cosmetic problem and can leave your tree open to other infections. Rake up all the mulch under infected trees and dispose of it in garbage bags or by burning to kill the fungus. Use sterile pruning techniques to remove infected limbs and foliage from the trees themselves and dispose of them in the same manner. If the problem persists, you can try a fungicide, but you will need to take care to cover the top and bottom of every single silver maple leaf. Removal of mulch at the end of the season should resolve the problem for next year without chemical treatments. Phyllosticta is a highly localized infection that creates dark brown or purple spots on the leaves with a black spot in the middle of the larger, colored spots. If you look closely, you will see that what looks like one large, black spot is actually a ring of small, fruiting bodies. Generally you can control this cosmetic issue by removing and disposing of affected foliage and raking up mulch underneath the trees. However, if the problem persists, a fungicide containing mancozeb or chlorothalanil should eradicate the infection. This moth is a serious problem in maple nurseries in the northwest United States. When the moth's caterpillars bore into the new growth on the silver maple, the leaves at the ends of the branches start to turn brown, die and fall. If you look closely, you will see small, black spots near the stems of the leaves where the caterpillars bored into the foliage. This infestation can be controlled with pesticides, but you will need repeated applications since the caterpillars enter the leaves almost immediately upon hatching.